As if Funko hasn’t had enough phenomenal success with their Pop figures, they also produce a completely different line of cutesy collectibles called Dorbz. Here is number 407 in its long list. This Superman figurine is made of vinyl and has a hefty ’S’ curl on its forehead. These figures are designed without actual legs but are painted to look as if they do.It may not seem like it, but these figures are balanced to stand on their own perfectly. January 15, 2019 in FIGURES / STATUES. 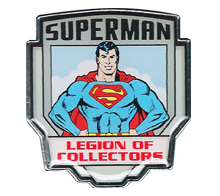 Among the goodies found in the Superman Legion of Collectors box in 2017 was this very striking lapel pin. Produced by Funko, this pin features a waist-up image of a Bronze Age Superman with his fists on his hips against an art deco style field. April 23, 2018 in JEWELRY / WATCHES / CLOCKS. Among the goodies within the Superman Legion of Collectors box released in 2017 was this exclusive Pop! Heroes Classic Superman vinyl figure (copyrighted 2016). Number 159 in the series, this figure features Superman in his classic suit with a lighter blue hue and red trunks standing in a heroic pose with his fists at his hips. February 13, 2018 in FIGURES / STATUES. Here is an unusual looking Superman figure. This is a Batman v Superman: Dawn of Justice Vinyl Idolz Superman statuette. Produced in 2016 by Funko (the company who brought the world the extremely popular Pop figures) this is yet another product released by the company to try and capture interest in the collector market. The statuette is number 41 in the series. January 9, 2018 in FIGURES / STATUES. Another item that was included in the 2017 Legion of Collectors Superman box was this Funko Pop! Superman keychain. The figurine stands at only one and a half inches tall and is in the same flying pose as its regular sized counterpart released at the same time. August 15, 2017 in NOVELTY. July 6, 2017 in FIGURES / STATUES, FILM / RADIO / TELEVISION. June 22, 2017 in FIGURES / STATUES.